You will love his swim training sessions in these Dolfin Uglies Orbit Jammers! This Dolfin Orbit jammers have a unique spiral print which looks cool and stylish! These swim jammers feature excellent comfort and durability making them perfect for regular swimmers! The Dolfin Uglies swimwear range offers excellent colour and shape retention properties due to the chlorine resistant fabric it is made from this allows your swimming jammers to look like brand new for longer! The Men's Dolfin Orbit Jammers comes with a unique and colourful spiral print, these swim jammers are a great choice for swim training sessions and fitness swimming. These Dolfin Orbit jammers are made from a chlorine resistance fabric which provides high quality colour and shape retention properties making them ideal for training, fitness and leisure swimmers! This Orbit Jammers are part of the Dolfin Uglies range of swimwear. 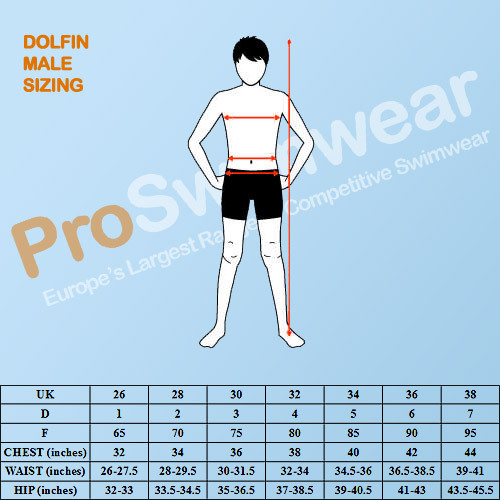 Uglies Swim Jammers and Swimsuits are popular among swimmers because of their excellent lifespan, comfortable fit and bright, colourful designs. For many years, Dolfin Uglies have been the training suit of choice for a lot of swimmers and their popularity only continues to grow! Remember to rinse your Uglies swimwear in fresh cold water and follow the care instructions to get the most use out of your uglies swimming costume. Men's Orbit jammers from the popular Dolfin Uglies collection. Easily adjustable drawstring gives a secure and comfortable fit with full freedom of movement for all swim strokes. Durable swimsuit fabric makes this swimming jammer perfect for regular swim training, fitness and leisure use. Front lining for comfort and confidence. Chlorine resistant material provides superb colourfastness and shape retention. (does not fade or go baggy).